Mr Bhimrao graduated from India in 1992. 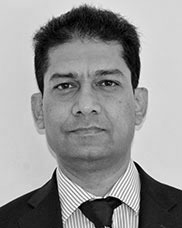 He was appointed to the post of Consultant Ear, Nose & Throat Surgeon at the University Hospitals of North Midlands NHS Trust in January 2012 with a specialist interest in Otology (Ear surgery). He has worked with the best in the field during his training both in Cambridge and in Vancouver, Canada and has developed extensive experience in treating middle ear diseases, Hearing & Balance conditions and Paediatric ENT. He has been awarded Doctor of Medicine from the University of Southampton for research in Nasal allergic conditions. Gareth Rowlands, Phil and Marianne Holt gave presentations on Hearing loss, Tinnitus and Dizziness to a group of 30 enthusiastic General Practitioners.